Although the calendar indicates that Fall is officially here and underway, Southern California hasn’t gotten the memo. It’s still hot around these parts (we’re flirting with the 80’s) but temps have been dropping and I hope they continue to do so. There’s no time of year I love more than Fall. I usually break out the Fall / Halloween décor by late September / early October to really get into the spirit of things that this time of year brings but with everything we’ve been through over the last few months, I just haven’t gotten around to it. With Halloween almost here and Thanksgiving just around the corner, I wanted a quick and simple project that would sprinkle our home with those warm and cozy fall feelings without having to drag our décor bins from the depths of the black hole garage. 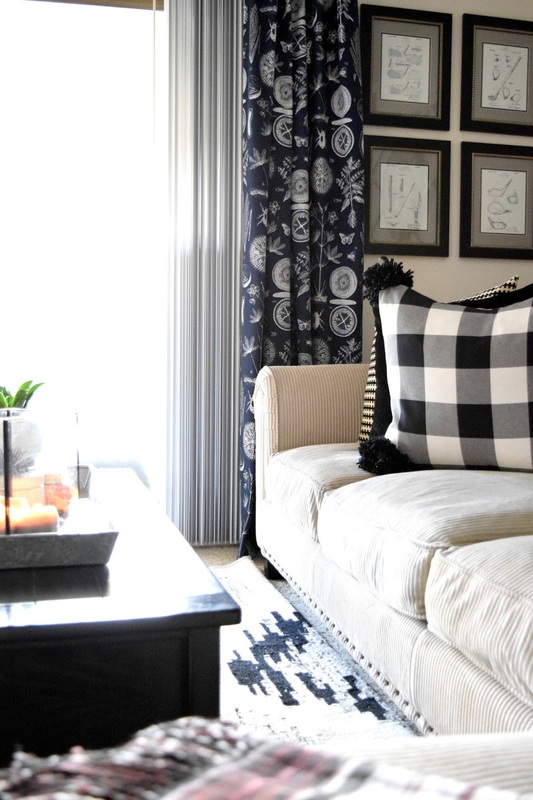 Buffalo check is all the rage right now and what perfect timing because this bold take on a classic plaid print is so fitting for the season. 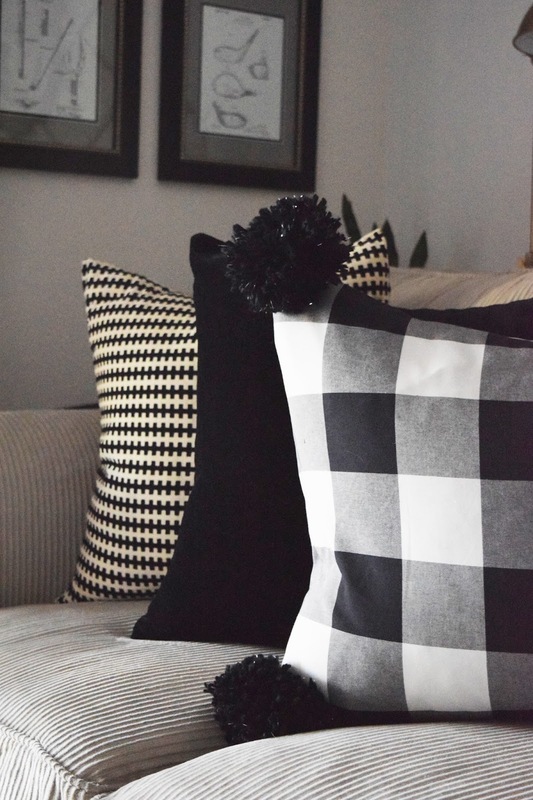 Ive been oogling over these gorgeous pillows but when I spotted a similar fabric at Ikea for a fraction of the cost, I picked up a yard on a whim and decided to make my own low-budget version. 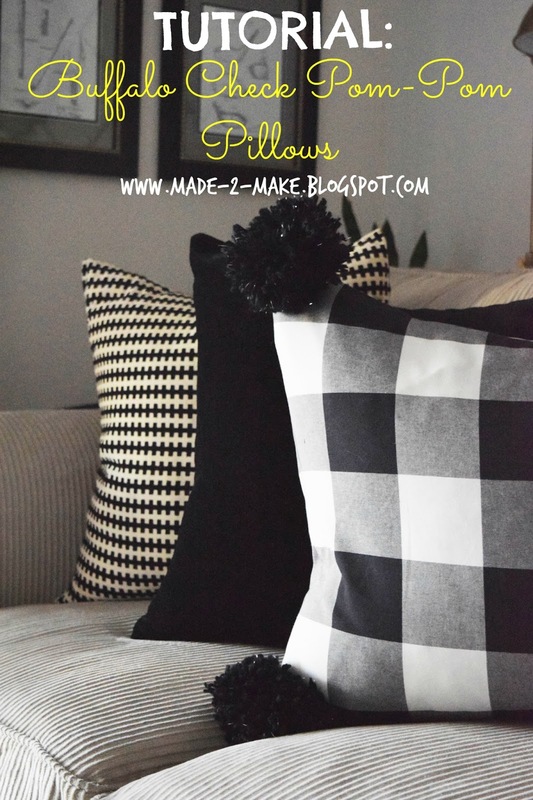 If I’ve said it once, I’ll say it again – pillows are the easiest way to change up the look and feel of a room in an instant without much of an investment. So with my Ikea fabric, I made two pillow covers in about 30 minutes start to finish all in an effort of infusing a little fall coziness into our main living space. I’ve done my fair share of sewing but usually just ask my super-sewer Mom to make my pillow covers for me instead of bothering to do it myself. But these ones? They’re all me! Even someone with the most basic of sewing skills could whip these up, no problem! With a little direction from my Mom, I made two super simple envelope style pillow covers out of 1 yard of fabric. The Internet (and Pinterest) is flooded with tutorials for this type of DIY so I won’t bore you with another – just click here and use any one of these tutorials to make your own. But how about a few helpful hints before you dive right in? #1 – Always remember to make your cover smaller than your pillow insert. This may seem illogical but it’s the most important thing I’ve learned and the key to getting the fullest pillows! A general rule of thumb is to make your cover 2″ smaller than your pillow insert. For example: if your inserts measure 20″ x 20″, you’ll want to make your pillow cover a finished size of 18″ x 18″. Be sure to account for your seams when cutting your fabric! #2 – Reinforce the seams where the two back flaps of your cover overlap. When you’re stuff your cover with the insert, that area will have the most stress put on it from all the pushing, pulling, and re-arranging your insert. Having a reinforced seam will make sure that your cover doesn’t literally rip at the seams. With those tips in mind, after my covers were sewn, I gave them a quick press with the iron just to iron out any wrinkles and to press the seams. But I didn’t stop there. 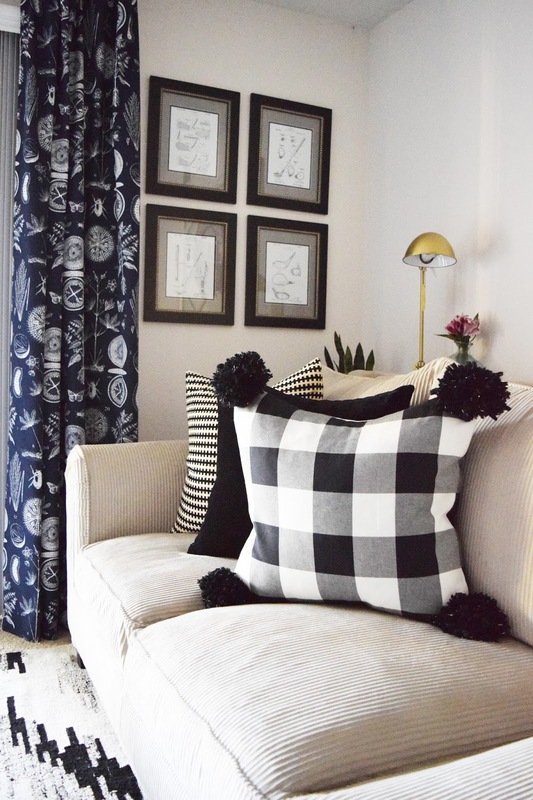 I decided to add a few yarn pom-poms to each corner of the pillow because nothing says fall like a good plaid and some cozy textures! I wrapped the yarn loosely around my fingers approximately 70 times until my bundle was pretty thick. 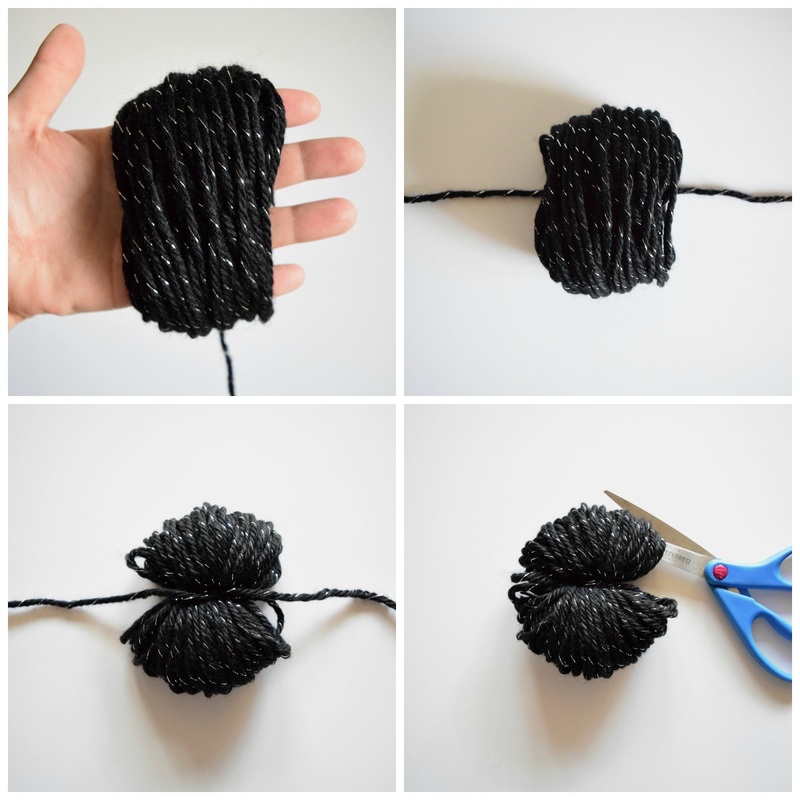 The same technique can be used around less fingers or wrapped around fewer times to achieve a smaller pom-pom too. There are several tools out there that you can buy to assist you in making pom-poms but I didn’t have any of them so I improvised and used my fingers instead which seemed to work out just fine. Once I wrapped the yarn around a sufficient amount of times, I carefully slid the bundle off my fingers and laid it in the center of a 12″ piece of yarn that I had previously cut. With the single piece of yarn, I tied a knot in the middle of my bundle and then flipped it over and tied a second knot. With the tied bundle, I slid my scissors through the loops on either end and cut – careful not to cut the center tie. 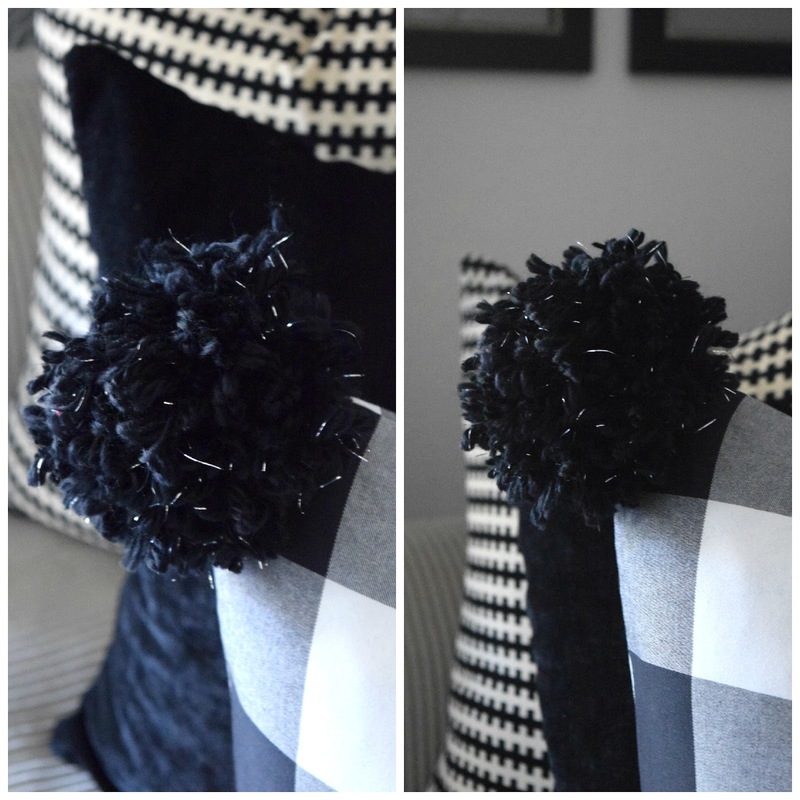 After cutting all the loops on either end you can choose to trim your pom-pom for a more uniform look or leave it as is. Once I had all my pom-poms made, I used a steel yarn needle threaded with a length of yarn and sewed each pom-pom to the corner of my covers. Easy-peasy! Ready to see the final result? 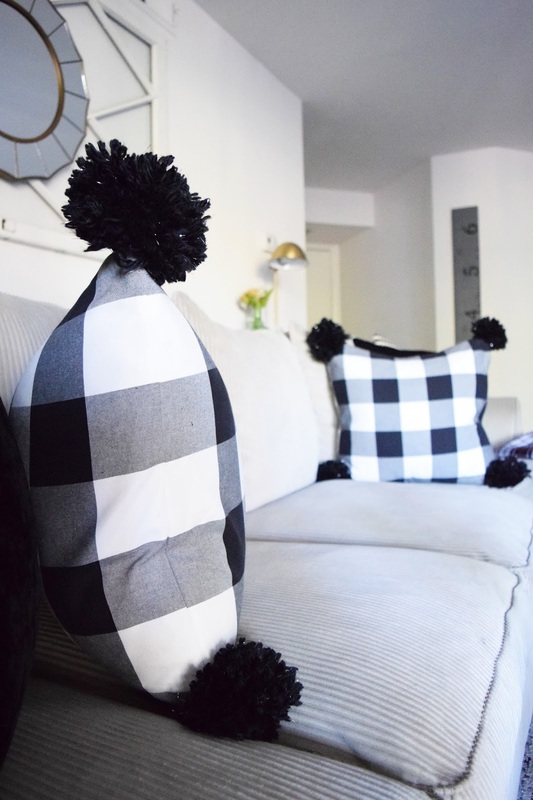 How cozy are these pillows? And what a big difference they make! Not too shabby for $20, right?! Gimme all the heart eye emojis…I think I’m in love! Are you too? Please tell me you agree!